With the growing disposable income of the consumers both in rural and urban India, there has been significant increase in household expenditure. The life standards of the consumers have changed and they are more willingly spending on premium and luxury products. As per Datamonitor report, these factors are helping the Indian confectionary market to grow and strengthen its position as 14th global confectionary market by 2014. As per the Datamonitor report, “The organised sector of the confectionery market in India is estimated to be about Rs 78,724.7 million and it is has grown seven percent in 2011 from 2010.” The confectionery industry in India is the largest among the food processing industries. Indian confectionary market is divided into three segments - chocolate confectionery, sugar confectionery and gums. Chocolate confectionary sales have grown by 13 percent in constant value terms in 2010 which earlier was 10 percent in 2009. The reason for this 3 percent of growth in sales of confectionary lays in the market potential of tier 2 and tier 3 cities. During 2010, a lot of confectionary manufactures introduced their products in smaller packs which were low priced specially focused on rural consumers. 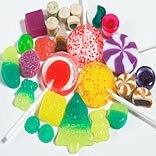 Furthermore, giving chocolate as a gift for festive occasions has also been one factor for the growth of the category. Gum value sales grew by 4 percent in 2010, 1.6 percentage points up on the previous year. The sector is showing robust performance driven by rising consumption in tier 2 and tier 3 cities. The consumer base for functional gum is still relatively small because its average retail price remains much higher than that of other gum products. The active support from manufacturers in creating awareness regarding dental benefits and introduction of sugar free gums has helped in increasing the consumption of gums in the country. A large part of the confectionery industry in India comprise of the local subsidiaries of global confectionery majors such as Perfetti, Lotte, Wrigley's and Cadbury. As per Euromonitor report, Cadbury Plc is the leading player in the confectionary market of India with a brand share of 32.8 percent in the year 2009. The second leading player in the category is Perfetti Van Mille Group with a brand share of 19.2 percent in the year 2009. The other brands such as Nestle, Hershey and ITC has brand share of 17.5 percent, 4.2 percent and 3.4 percent respectively. The future growth of the confectionary market will be driven by increase in consumer sophistication and change in socio-economic status of the market. To strength their position in the market, brands need to study the consumer psychology more closely. Continuous innovations, new product development, better marketing strategy and deeper understanding of the key trends driving growth in the confectionary category will help players to catch bigger share in the market.